This unique instrument is played by striking the strings with small wooden mallets. Just about every country in the world has a variation of this instrument: the "Yang quin" (yang cheen) from China, "Hackbrett" from Germany, "Cymbalo" from Italy, "Cymbalom" from Hungary, and "Tiompan" from Ireland. Some believe that the hammered dulcimer is an ancestor of the piano, and originated in the Middle East, dating back to as early as the seventh century B.C. Here is another opinion. I play a D500 hammered dulcimer built by Sam Rizetta of West Virginia, This outstanding dulcimer design is currently manufactured by Dusty Strings in Seattle. The damper system on my dulcimer was installed by a company called Whamdiddle in Seattle, though Dusty Strings now provides an optional damper system on their instruments. There's a wealth of information on this site for both hammered and fretted dulcmers: discussion groups, links, marketplace, articles, tips for beginners, etc. A quarterly publication which you can also subscribe to online; it features information for both hammered and fretted dulcimer enthusiasts: tunes, tips for beginners, reviews, etc. 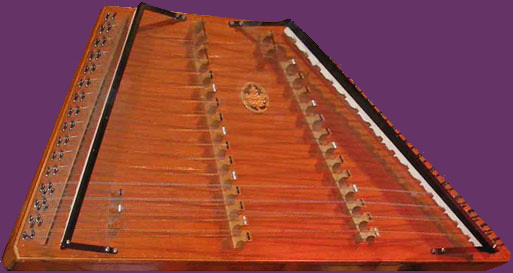 Manufacturers of quality hammered dulcimers and other instruments, located in Seattle. 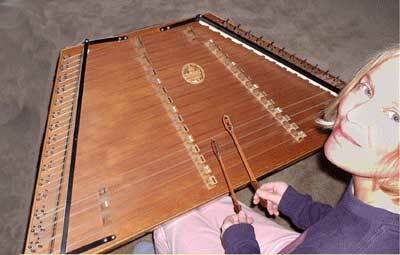 Lots of links here for hammered dulcimer enthusiasts. Order a great pair of hammers with durable ebony edge.